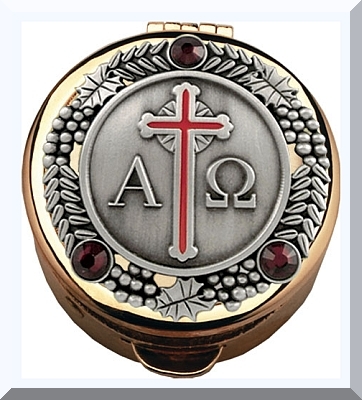 Gold Pyx for carrying the Communion Hosts to the homebound or hospitalized members of your parish. For Eucharistic Ministers, Pastors, Priests or Nuns to choose from. 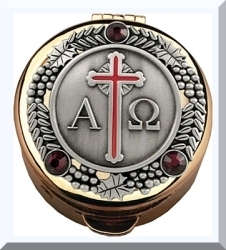 This elegant pyx features red crystal accents with wheat, grapes and the Alpha Omega symbol on top of the case. This Catholic Pyx is made of polished gold-plating cast with a hinge & push-button opener. Includes Velour Burse for carrying & protecting the pyx. This would make a nice gift for the Religious. MADE IN THE USA! Size Medium: 2-1/8" Diameter x 1/2" Deep - holds 12-15 hosts. NOTE: The number of hosts that can fit in each Communion Pyx depends on the thickness of each host. NOTE: Since this Pyx is made in the USA it may take longer to arrive. Please allow up to approximately 3 weeks for delivery. Thank you!